Managing editor Dave Donovan explains in detail just exactly how far The Australian went to smear IA contributor Peter Wicks. Last week, this publication was disgusted to find The Australian newspaper had published an attack piece by freelance journalist Brad Norington on Independent Australia contributor Peter Wicks. This piece, which purported to be a news article, was so inaccurate, false and misleading – and has omissions so intrinsic to any proper understanding of the facts − that it can only be described as an intentional smear, calculatedly determined to destroy Peter Wicks’ reputation and damage those around him. In our opinion, it is defamatory and those responsible for it should be condemned. As detailed in the accompanying piece, Peter Wicks has made a complaint to The Australian, which has refused to issue an apology, despite removing some of the false claims. We further understand Wicks has lodged a complaint with the Australian Press Council and is considering other legal action, something we fully endorse. The following is a response to just some of the false claims made in this article. Mr Wicks has not disclosed his role as a paid political staffer on his Wixxyleaks website…. Peter Wicks has been working for Michael Danby since 31st October, or about a month. 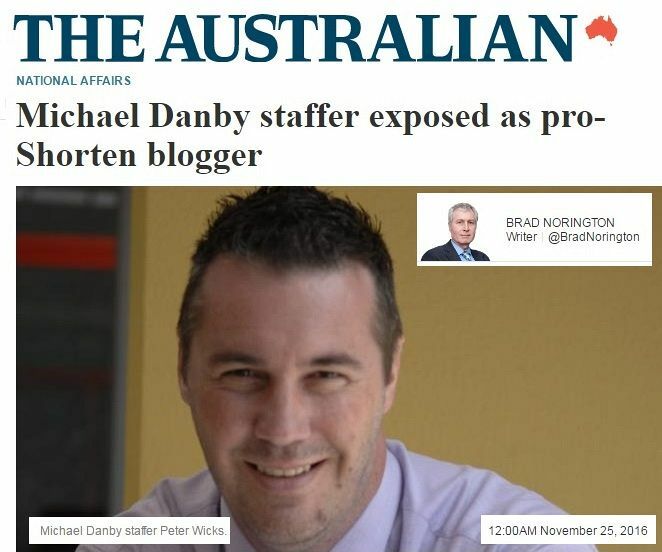 His blog Wixxyleaks, which Norington is referring to, has been in existence since January 2010 and makes plain that Wicks is a current Labor member and a former NSW State Labor candidate. Wicks has also been a constant contributor to Independent Australia ‒ a member of the Australian Press Council and much more popular website than Wixxyleaks ‒ since 2011. Further, Wicks’ recent employment as a staffer was included in Wicks’ Independent Australia bio in a timely fashion, well before Norington’s article was published in The Australian. However, Norington does not mention Independent Australia at all at in his piece — the first of many glaring omissions. In any case, anyone reading Mr Wicks’ work would be under no illusion as to his political allegiances, as he explicitly points them out in virtually every one of his pieces. Given a host of writers for The Australian do not at all or poorly disclose their political memberships or allegiances, Peter Wicks would appear to us to be a far better example of transparency than the demonstrably and overtly partisan publication to which Norington contributes. Mr Wicks has not …. revealed his personal ties to Senator Kitching and Mr Landeryou, both firm backers of Mr Shorten’s dominance of the ALP Right faction in Victoria. The fact Peter Wicks is in contact with Senator Kimberley Kitching’s husband Andrew Landeryou, and that he is a source, is no secret and has, in fact, been written about on Wixxyleaks and Independent Australia many times. … you will never hear me claiming to have broken the whole story, asthere were others writing about Jackson’s deeds well long before I came along. In particular, Vex News run by Andrew Landeryou. Vex had been following this saga for years before I arrived on the scene and had delved into the fallout from the Jeff Jackson and Pauline Fegan factional brawl that became the catalyst for everything that followed. While Vex may have not followed the saga through to its current point, Andrew’s assistance and knowledge has been invaluable to the Jacksonville series, despite us disagreeing occasionally. This quote comes from a piece in which Wicks discusses poor reporting by Norington (and others) in the Jacksonville affair. We can be confident Norington read this piece and so can conclude that this was not a negligent oversight on his part, but rather a deliberate and malicious lie. How do we know Norington read the piece? … Sales introduces Brad [Norington] as someone who has “followed every twist of this saga”. How he managed to do that is difficult to work out, given that for much of the saga Norington was a foreign correspondent for The Australian, based in the United States. In fact, Norington came to the saga at around the time Jackson was appearing before the Trade Union Royal Commission, in 2014, years after Independent Australia started exposing Jackson and Lawler, in May 2012. Norington has done little or nothing to correct the false impression that he has been there from the start of this saga. Norington came into the story shortly before the Royal Commission commenced, and despite the rhetoric has uncovered little if anything new in the Jackson HSU matter, instead relying on the work of others to make up his book Planet Jackson — a title strangely similar to the “Jacksonville” title IA and Wixxyleaks used for the series of articles on Jackson's deeds that preceded other mainstream reports by several years. I assumed he meant 'Authors Note', but I think it’s fair to say he took it personally. However, he had failed to correct the record on air when he given the chance and I thought it was important to do so. Given Norington has been shown to have read this part of the piece, we can reasonably conclude he had read the part of the same piece in which Wicks disclosed his ties (not for the first time) to Landeryou and, therefore, intentionally lied about it. But moreover, what this exchange also demonstrates is that Norington himself has – or at least had − close personal ties to Peter Wicks. It also shows that Wicks had helped fill Norington in on the parts of the saga he had missed when he was The Australian’s New York correspondent from 2012 (perhaps even earlier) up until 2014. Despite mentioning later in the piece that Wicks had been critical of his reporting, Norington did not disclose his personal ties to Wicks, nor did he mention his bitter personal grievance with Wicks, or angry text message to him. Given the nature of Norington’s attack on Wicks for some supposed conflict of interest based on Wicks’ personal ties to Landeryou and Kitching, the hypocrisy is manifest. More so, when one consider that, although openly acknowledging them as sources, IA has very good reason to believe Wicks’ ties to Landeryou and Kitching are not at all close ties. Indeed, based on our personal experience, Wicks has always retained a healthy scepticism about any information he may have received from Landeryou (and others). Norington nowhere tells his readers that he is a competing with Wicks on writing about the HSU saga, nor that Wicks has been following the saga for longer and is widely regarded as more of an authority on the subject. Norington also does not mention that the sources for his version of events are allegedly Chris Brown and Craig McGregor — the factional rivals of the Union branch run by Diana Asmar, whom Norington also attacks in his piece. On this point, it should be noted that Health Workers Union secretary Asmar recently wrote Norington a scathing and rather telling letter that Wicks reproduced in Wixxyleaks on November 8, and that Brown has recently been accused of improper spending of union funds. The first point is that Norington’s article is itself littered with 'defamatory and factually incorrect claims'. So much so that Independent Australia understands that Wicks this week lodged a complaint about it with The Australian Press Council. He has also written to The Australian newspaper demanding a retraction and an apology, although the newspaper has responded that they “stand by the article” and the false claims within. On the very rare occasion an error is made, both IA and Wixxyleaks correct errors immediately, unlike The Australian. Neither Mr Wicks nor Independent Australia have ever been sued for defamation or been found to have written anything defamatory. The same cannot be said for The Australian newspaper. Indeed, when it comes to being factually correct on Jacksonville, I’m certain Mr Wicks would be happy to sit down with anyone from The Australian and compare articles and accuracy. Especially considering The Australian spent years claiming Kathy Jackson was a heroic whistleblower and, in fact, in 2012 published a front page smear on Peter Wicks and Independent Australia for accurately reporting the truth. Senior ALP and union readers of Mr Wicks’s blogsite say it has become more clearly identifiable lately as propaganda for Mr Shorten’s side in politics. They suggest it could serve as a front for Mr Landeryou, who closed down his own “poison pen” Vexnews website in 2013 at Mr Shorten’s request — but could be back in business if he was using Wixxyleaks as a new outlet. Vexnews talked up Mr Shorten while publishing allegations against people regarded as critics or opponents. “You can see the hand of Landeryou in some of the latest posts,” one reader claimed. Melbourne ABC radio broadcaster Jon Faine said … “There are many people intimidated by Andrew Lander­you and the way he uses Vexnews to bully and undermine and ruin people’s reputations,” Faine said. The suggestion Landeryou is writing Wicks’ stories on Wixxyleaks – and therefore on Independent Australia, since IA republishes many of Wicks’ stories – is a very serious accusation. It infers that Wicks lacks integrity and is deliberately misleading readers. Both Peter Wicks and Andrew Landeryou have strongly denied this allegation, which Norington seems to imply was made by a single anonymous reader. In our view, Norington and The Australian accusing others of using a “poison pen” to make false and defamatory statements in an effort to destroy others’ reputations would appear to be a perverse and utterly hypocritical case of projection. Based on the evidence, this statement in Norington’s article would appear to be completely false. In fact, Wicks attempted to return Norington’s call a week before his Australian article was published and, in fact, emailed him on the Sunday regarding the issues he had reaching him. The phone records and emails supplied show that Norington and Wicks did, in fact, speak three days before the article was published and that it was Norington who returned Wicks’ call. It would appear that Norington was attempting to claim that Wicks had refused to discuss the matter with him when, in fact, the very opposite was true, as the phone records and emails attest. We note that The Australian has since removed this paragraph from the online version of this article, subsequent to Peter Wicks complaining about the article and detailing this error. They have done so without acknowledgement or apology after issuing a statement that they would not apologise, and that they stood by the article and everything in it. This sort of poor reporting and subsequent cover-up cannot be excused. This statement is just a lie. A weird lie, made for no apparent reason, apart from – Peter Wicks speculated to the author – as some sort of a reflection of class. In any case, Wicks says he has been in a few hardware stores, but has never, ever, worked in one — nor a timberyard, a tool shop, a mower store, a gardening stop, or anything even remotely like a hardware store. It is this kind of mistake that makes Norington’s statement that Wicks is prone to making ‘factually incorrect claims’ even more bizarre. Any unbiased consideration of Wicks’ work will show that his “favourite cause” has not been Craig Thomson, but rather the exposure of corrupt union official Kathy Jackson, as shown by the name Wicks chose for the scandal — Jacksonville. In fact, IA and Wicks spent years investigating Jackson’s crimes, which were long overlooked by the mainstream media, including The Australian. Both Wicks and IA have been resoundingly vindicated for their relentless work on Jackson, who is now universally seen for what she is ‒ a corrupt former union official ‒ and not the heroic whistleblower that the mainstream media and the Liberal Party long presented her as. Regarding Craig Thomson, it is true that Wicks and IA did regard the mainstream media’s reporting as being inaccurate, unbalanced and vindictive, which it clearly was. However, neither Wicks nor IA ever suggested that Thomson was completely innocent. Indeed, Peter Wicks has accurately reported the court findings regarding Craig Thomson in relation to the use of cash and credit cards. More particularly, that Thomson was found not guilty of using his union credit card for prostitution services — something that was correctly reported by the ABC, Fairfax and, of course, the court. Thomson’s guilty charges were, in fact, in relation related to cash payments made by him. He was found not guilty of charges relating to the infamous credit card statements and payment slips from a Thomson with a “P” (“Thompson”) credit card — something that has, once again, been inaccurately reported by Norington and The Australian. So much for a “poison pen”, the grubby Norington piece in The Australian was nothing more than an extended series of lies held together by a flimsy tissue of half-truths. Norington and News Corp should be condemned for this false and defamatory attack, and both he and The Australian should immediately retract and apologise before any further damage is done. It is this sort of reporting by The Australian that has them widely seen as a blight on the Australian media landscape and reinforces IA political editor Dr Martin Hirst’s recently published view that the News Corp press constitutes a clear example of the "hate media" in action. Truthful reporting. Subscribe to IA for just $5.